AS evening began falling across London on December 30 1952, bus driver Albert Gunter most have wondered if he'd lapsed into a nightmare as he started driving his Number 78 bus across Tower Bridge straddling the River Thames. For the centre of the bridge comprises two 30m long hinged bascules (or leaves) that open upwards at over eighty degrees to allow ships to pass through, and to his horror the one he was on was rising at an increasingly sickening angle right under his bus and its twenty passengers. Making a split-second decision, Albert dropped two gears and gunned the engine of the cumbersome double-decker as fast as it would go – miraculously leaping the vehicle forward from the bascule, and somehow "flying" it through mid-air to drop, deafeningly but still upright, almost two metres down onto the opposite leaf that had not yet begun to rise. His conductor suffered a broken leg, twelve passengers received minor injuries, and Albert himself was given a ten-pound reward for his heroics (about AU$450 in today's money)… with a subsequent inquiry finding the bascule had been raised due to a mix-up amongst staff. 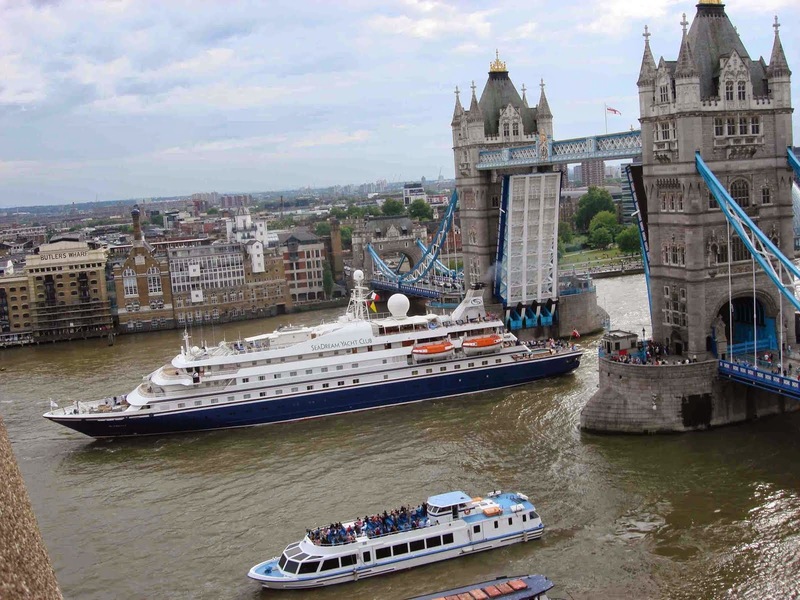 There've been plenty of other mix-ups over the years with the timing of Tower Bridge's openings, the most bizarre involving a motorcade of US President Bill Clinton in May 1997. 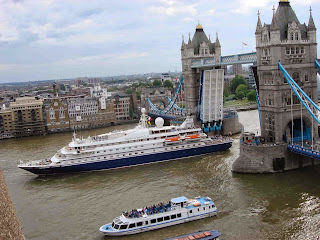 The President and British Prime Minister, Tony Blair had dined at a restaurant on the banks of the Thames that day, and were warned that Tower Bridge which they needed to cross to get back into Central London, had been booked to open in the early afternoon for a tourist sailing barge, the Gladys to pass through. Because he was late leaving the restaurant, when President Clinton got to the bridge and his limousine and lead security vehicles were almost across, to the horror of his tailing security agents, to allow the Gladys through on time the two bascules had begun rising before those agents, too, could get across. Screeching to a stop they watched unbelievably as their President disappeared unprotected into the chaos of London traffic on the other side of the river; when asked why they'd cut the motorcade in two, bridge staff said they'd simply opened the bridge on schedule, and as for the late-arriving motorcade "when we'd tried to contact the American Embassy, they wouldn't answer the phone." When it was decided a bridge was needed near to the Tower of London, over fifty entries were submitted in a competition for a suitable design. 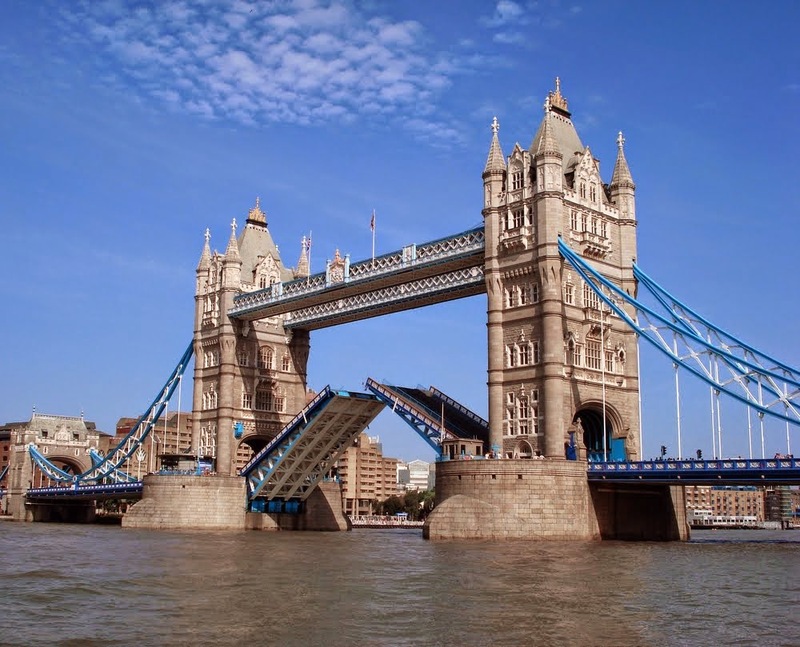 The winning one came from London's City Architect, Sir Horace Jones – who happened to be one of the judges – and the bridge opened on June 30 1894. Some 11,000 tonnes of steel went into its twin towers, two walkways between the tops of these, the opening bascules, and suspension bridge approaches linking the towers with shore on either side of the river. The steel towers were then granite- and stone-clad to give a more pleasing appearance, although not everyone agreed with that. Prominent artist of the time, Frank Brangwyn complained "a more absurd structure was never thrown across a strategic river," while noted architect, Henry Statham sniffed that the bridge "represents the vice of tawdriness, pretentiousness and falsification of the facts of the structure." The 60m long open-air walkways between the tops of the two towers were designed to add support to the towers, as each hinged bascule weighed over 1,000 tonnes, exerting a huge pull on each tower; 120 years later those bascules are still raised some 1,000 times a year. The high-level walkways that quickly proved convenient places of business for prostitutes were soon closed, to be re-opened seventy-odd years later as an enclosed permanent Tower Bridge Exhibition. 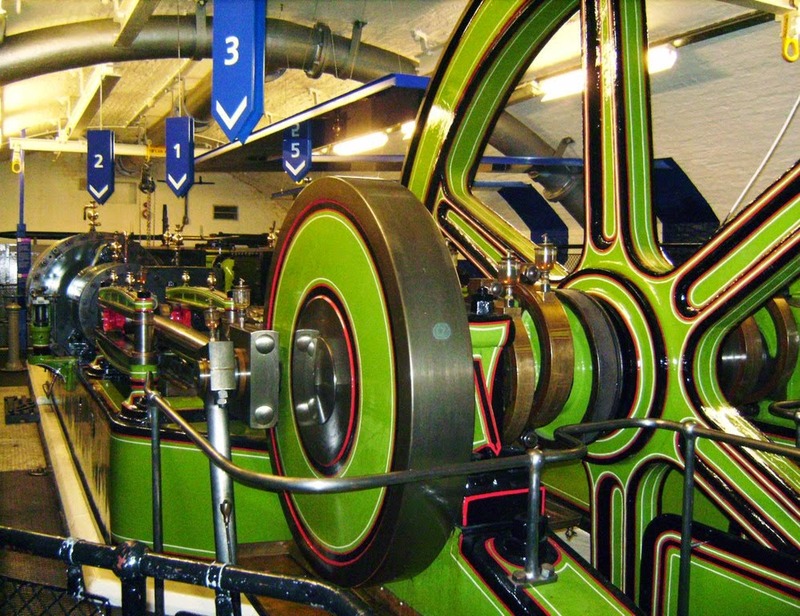 This features films, photos and interactive displays depicting the bridge's history, construction and workings, and includes access to the Victorian- era engine rooms and huge original hydraulic pumps that operated the bascules. And water traffic still takes precedence today over road traffic as President Clinton was to discover, while in August 1999 a Freeman of the City of London, a title going back to ancient times, claimed another old right and held-up road traffic as he herded two sheep across Tower Bridge in protest at the erosion of government services for older citizens. 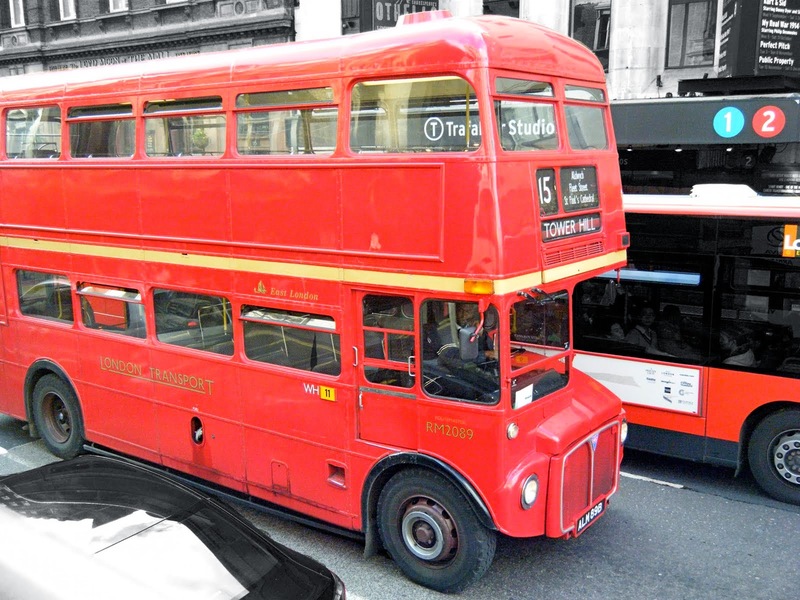 DOUBLE decker bus like the one Albert Gunter miraculously leapt through mid-air.